Leading American manufacturer of commercial and consumer metal products, Glaro Incorporated, ships products in three days or less. Our company is committed to making sure that orders are shipped consistently in one to three days. Glaro Inc., long known for manufacturing quality commercial and consumer metal products supported by superior customer service, is uniquely set up to quick ship over 2500 products within three days, a shipping timeline that is a rarity in the industry. Even large orders are shipped in unusually short periods of time. In fact, in addition to other leading categories including waste receptacles, bellman carts, crowd control equipment and pedestrian guidance systems, Glaro has the largest most diversified collection of quick ship recycling receptacles in the industry. The company’s history and USA roots helps illuminate how Glaro’s unmatched shipping service is possible. Since 1945, when the manufacturer opened its doors, the company has operated as a true “Made In America” metal manufacturer. In fact, the Glaro manufacturing facility works with a total in-house concept. From R&D, engineering, metal spinning, machining, tooling, fabricating, forming, stamping, powder coat painting, degreasing, and assembly to shipping, the manufacturer maintains complete control over quality, including its timelines. 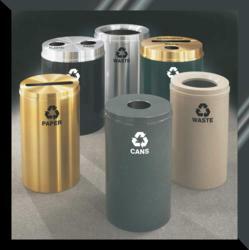 With its full-service facility and nimble product development team, Glaro also designs and manufactures custom products, such as metal waste receptacles and recycling receptacles with silk screened messages and corporate or government logos. Glaro’s innovative RecyclePro recycling containers, for example, gained notoriety when they were developed and eventually became a standard for the U.S. Senate, U.S. House of Representatives, and other divisions of the U.S. Government. “Because we have total metal fabricating capabilities on American soil, we can address requests for modifications, or customized products and messages for our customers,” commented Mr. Betensky. These positive attributes and assets have enabled Glaro to become a leader in the industry and the choice product line for industry dealers, purchasing agents, designers, architects, and specifiers for almost 70 years. Full details about all Glaro products, including new lines of recycling receptacles, umbrella bag holders, coat hanging equipment, bellman carts and waste receptacles can be reviewed and downloaded on the Glaro Inc. website, glaro.com.